Cuts and lacerations have many complications, such as risk of infection. But any cut can also cause significant emotional distress, especially when it leaves behind a scar on a visible part of the body. Facial injuries in particular can be traumatic, and many accident victims suffer serious facial wounds when they slam their faces against something, such as a steering wheel. If you have suffered cuts, there are things you can do to minimize the risk of scarring. The American Academy of Dermatology recommends the following. Removing dirt and other debris encourages the body to heal. It also reduces the chances of infection, which can make it harder to recover. Wash your cuts gently using soap and water. If your wounds are very deep, you can have someone at the hospital clean your wounds because they might need to remove other material, such as dirt or pieces of clothing. This is key to preventing scarring. After cleaning the wound, apply petroleum jelly which will prevent the skin from drying and forming scabs. If your wound has a scab, it will take more time to heal. Also, a scab that falls off early will typically leave behind a scar. Petroleum jelly can easily rub off on clothing, so cover up the wound with a bandage. You might also use a silicone gel sheet, which is easier to use for large wounds. Apply petroleum jelly liberally every day until the wound fully heals. If you stop early, then a thick scar could form. The majority of your skin is made up of water. You can promote hydration by drinking enough water during the day and also avoiding anything that is a diuretic, such as alcohol or caffeine. Most people need 8 glasses of water a day, depending on their height and body weight. A great way to know you have enough water is to check the color of your urine. It should be clear or very faint yellow. If it is darker, you are not drinking enough water. Very deep wounds might need stitches to hold the skin together. Ask your doctor how you should treat the wound so that you minimize scarring. Your doctor will tell you when it is okay to remove the stitches. If you remove them too early, scarring could be worse. Once your wound heals, you should cover it up with sunscreen. Too much sun can turn the scar a red or brown color, making it even more visible. To encourage it to fade, use a sunscreen with an SPF of 30 or higher. Even better, stay out of the sun entirely by covering up the wound (wear long sleeves, for example). If you have suffered cuts or abrasions in an accident, you might be able to receive compensation to cover the cost of medical care, pain and suffering, and emotional distress. Some cuts are superficial, but others can cause significant stress. Contact Bundza & Rodriguez today. 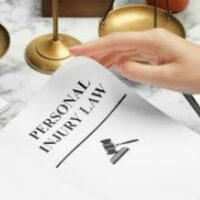 Our Daytona Beach personal injury lawyers have obtained millions for our clients, and we can help you as well. Call 386-252-5170 to schedule a free consultation.